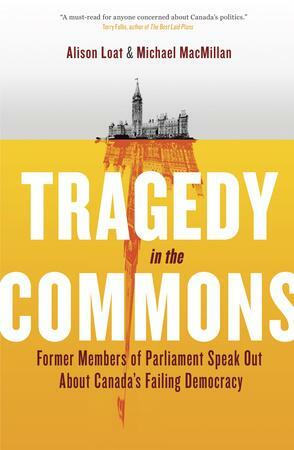 Alison Loat and Michael MacMillan’s Tragedy in the Commons depicts a parliamentary system in active decay—one that, like so many Canadian failures, will have its defenders until the bitter end, no matter the consequences. Nothing is quite so disenchanting about our civic lives as watching the art of politics actually take place. For all the pomp and ceremony—and some of it can be genuinely endearing—the parliaments that make crucial decisions about our lives can be consumed by trivia and game-playing that would make saints start flipping tables. And the reporters who watch these proceedings are not, for the most part, saints. Earlier this year, as the Ontario Liberals were consumed by another round of scandals relating to the cancellation of gas plants, NDP leader Andrea Horwath started asking clear, direct questions during Question Period. Rather than answer clear questions clearly, Horwath was instead mocked for having “Mulcair envy,” out of which the Liberals got no shortage of amusement. And yet, comparatively, that was such a humdrum act of disrespect across the House at Queen’s Park that it was barely noticed. Incredibly, as Question Periods go in this country, Ontario’s might not be the worst. Tragedy is a frustrating book, for a number of reasons. Reading it, you almost come to believe that nobody ever actually runs for high office, with the titanic investment of time and money that entails. Almost to a man and woman, as described by the authors, these MPs—cabinet members and a former prime minister among them—see themselves as having just sort of ended up in Ottawa about as haphazardly as one makes her way through a crowded mall. Are we at the right exit? Where did we park? Holy crap, I’m the MP for Thunder Bay-Rainy River. Whether it was Trudeau in his day or Harper in ours, the first and last objective of a political party is to hold enough seats in Parliament to govern. Both men, in their own ways, reshaped the political parties they led in the economic, political, and technological contexts of the day to form the party most capable of winning. Elections are Darwinian processes, and they push everyone in the same direction. For all the talk of “professional” political operatives, it’s disconcerting to think that all of our political professionalism is put to work on advertising and the spinning of elections, and not what happens the day after. It’s as if Major League Baseball spent billions of dollars on scouting but pennies on bats. Naturally, the media comes in for its share of abuse, with MPs saying the focus on Question Period in the daily news cycle does nobody any favours. Even though it makes up less than an hour each workday, QP’s prominence in the media means, perversely, an inordinate amount of staff time is spent on preparing ministers for it instead of, well, anything else in the observable universe. Some of the shift towards centralized power in the hands of party leaders is deliberate, on which Loat and MacMillan could have perhaps dwelled more. They mention that the section of Canadian election law which allows leaders to veto their local ridings over the choice of MPs was only introduced in 1970, and they note that Pierre Trudeau was the first Great Centralizer in modern Canadian politics, but the line between the two facts is not drawn as clearly as it could have been: that Trudeau the Elder, in his desire to control the Liberal Party of the day, has left us all with a tainted inheritance. Of course, it may have been nearly inevitable in any case. Whether it was Trudeau in his day or Harper in ours, the first and last objective of a political party is to hold enough seats in Parliament to govern. Both men, in their own ways, reshaped the political parties they led in the economic, political, and technological contexts of the day to form the party most capable of winning. Elections are Darwinian processes, and they push everyone in the same direction. I say “nearly inevitable” because, of course, there is another path. Rather than allow the self-interest of the actors involved to ruin the entire system—it’s no accident Loat and MacMillan invoke Hardin’s “tragedy of the commons”—we can push for restraints on individual action that improve the effectiveness of the whole system. Like so many Canadian failures, our system will have its passionate defenders to the end. The spectre of rogue MPs taking over local riding associations in the absence of a strong leader will continue to give some political nerds nightmares, and the much less fanciful scenario of simply losing elections will terrify the rest. The answer is some kind of multilateral disarmament, changes to the laws that govern the Commons and our elections to empower MPs and weaken party leaders. Michael Chong is trying, but it’s not clear if his bill will ever see Royal Assent. Why not? There are plenty of reasons, but I’d submit that even by the standards of Canadian parliamentary parties, the Conservatives and Liberals in 2014 are led by men to whom all the obligations of the party flow, and who owe little to their MPs. Stephen Harper led his party to every electoral success it’s ever had, and that buys a lot of obedience. Justin Trudeau, meanwhile, was chosen as leader explicitly as his party’s last, best hope to emerge from the political wilderness. How do you weaken a leader when you’ve all but admitted he’s the only game in town? One point that shouldn’t be overlooked in Tragedy in the Commons is just what an outlier Canada is: by multiple assessments cited in the book, our system concentrates more power in fewer hands than any other parliament. “There may be some exceptions in those African dictatorships that are part of the Commonwealth and so on,” IRPP research director Leslie Seidle is quoted as saying in an assessment that doesn’t really need to be completed for you to get the gist. But like so many Canadian failures, our system will have its passionate defenders to the end. The spectre of rogue MPs taking over local riding associations in the absence of a strong leader will continue to give some political nerds nightmares, and the much less fanciful scenario of simply losing elections will terrify the rest. Some people will even be sincere in their concerns, and unpaid. They will still be wrong.